Ok, this is getting fvcking ridiculous, im having to login to the app literally every time I open it, it crashed whenever I try to close out of a picture, and it's slower than ever, the app was unstable before but it's almost unusable now. @gravitycatnotamused1, have you tried turning the app off and then back on again? Unplugging it for 10 seconds then plugging it back in? @gravitycatnotamused1, I went through this a few days ago. It went away on its own. @gravitycatnotamused1, as soon as I updated the app it worked again. @gravitycatnotamused1, I haven’t had to log back in for years. @gravitycatnotamused1, my app auto-updated and now whenever I try to share a picture, the app immediately crashes and I have to restart and find my place again. And swipe. And swipe. And swipe. @gravitycatnotamused1, I haven’t noticed crashing, but I am noticing some severe lag when typing comments. It’s so bad, I can’t double-tap the arrow to do all-caps, so I need to do it letter-by-letter. @gravitycatnotamused1, I’ve never had a problem with it. Then again I paid a buck years ago to enjoy FP. Did....did someone actually do this? @Grizzy, oh god I hope so. Deadpool needs to exist in every universe. Lol. 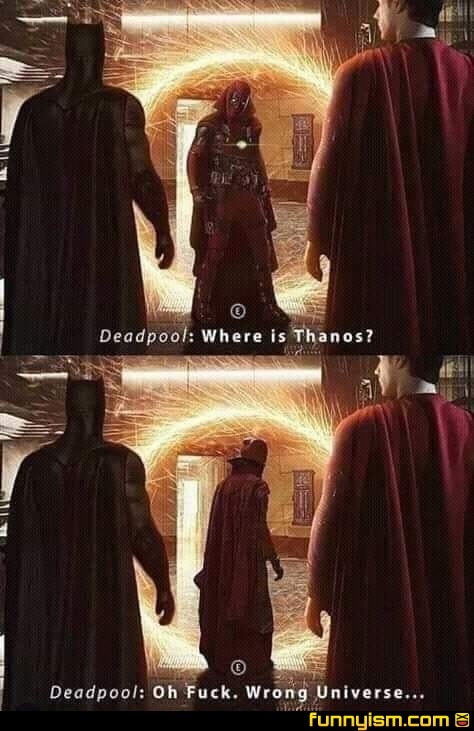 Dead Pool in Doctor Stranges cape. Curious to see how thaf meeting would go.